rules work in practice. 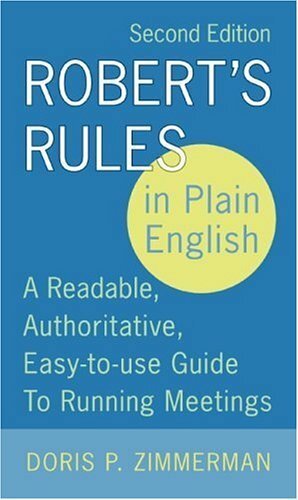 With an extended glossary and new chapters on electronic meetings and internet usage, Robert's Rules in Plain English , 2nd edition, is an authoritative, modern guide to running a meeting successfully and keeping it on track o Robert's Rules in Plain English , 2nd edition, makes the complex, overbearing web of parliamentary procedure easy to grasp for the average person. It is much easier to comprehend than its competitors, which enables readers to understand why these rules are in place, what the governing principles behind them are, and how to effectively implement the rules in your day-to-day meetings. o Robert's Rules of Order is required reading for members of unions, clubs, churches, civic and political groups, schools, governing bodies, and organizations of every type. Robert's Rules in Plain English , 2nd Edition, addresses this large, diversified market by offering clear, easy-to-understand directions that anyone can follow. Doris P. Zimmerman is a Professional Registered Parliamentarian, a member of the National Association of Parliamentarians and the American Institute of Parliamentarians, and founder and president of Parliamentary Consultants, Inc.